Some lots of cell lines registered as JCRB05XX were frozen by using glycerol as cryoprotectant instead of DMSO. 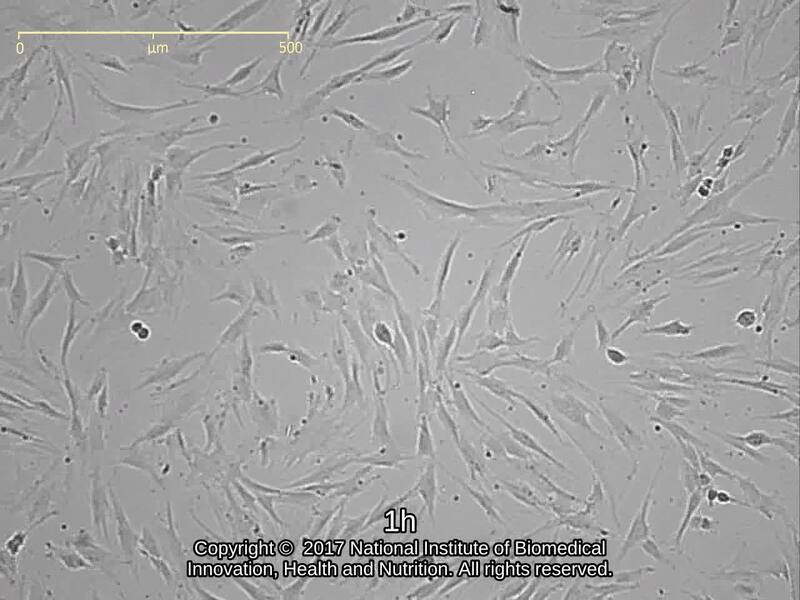 The cryoprotectant used was described on data sheet of the cell line. In the case of cells frozen using glycerol, the method for re-cultivation should be as follows. 1. Thaw the ampule contents as quickly as possible in 37 C water bath. 2. Under sterile condition, aspirate the ampule contents (about 1 ml) and transfer them to culture dish (6-cm diameter) or 25cm2 culture flask containing 4 ml culture medium. Do not centrifuge the ampule contents, because the replacement of glycerol is very slow and centrifugation/resuspension causes osmotic shock to the cells. 3. Cultivate the cells in CO2 incubator at 37 C for 12-16 hrs. 4. Exchange the all culture medium by fresh medium. Normal human diploid cell from skin. Maximum PD = 48. Cells may be distributed around PD15 - PD20. Wash in CMF-PBS.Add 0.25% trypsin.Incubate at 37C for 10-15min.Suspend cells in medium. Fetal-adult phenotype transition, in terms of the serum dependency and growth factor requirements, of human skin fibroblast migration. Eagle's minimum essential medium with 10% fetal bovine serum (GIBCO Cat. # 10099). This lot was frozen using DMSO. Eagle's minimal essential medium with 10% fetal bovine serum. (FBS; GIBCO Cat. #10099). This lot was frozen using DMSO. 2.6 - 4.7 x 10^4 cells/sq.cm. Eagle's minimum essential medium with 10% fetal bovine serum (FBS; Sigma Cat. # 172012). This lot was frozen using DMSO.